Brand: Lorann Oils and Flavors 42-490 Units: 4 fl. oz. jar Vanilla bean paste is a convenient, versatile alternative to vanilla beans. This rich concentrated paste can be used in place of an extract. It combines natural vanilla flavor and the distinctive vanilla seeds that will give your food gourmet appeal. Use it to flavor cakes, puddings, sweet breads, cookies, custards, whipped cream and ice cream or anywhere the flavor and appearance of a vanilla bean is desired. 1 Tbsp. vanilla bean paste = 1 vanilla bean. 1 Tbsp. vanilla bean paste = 1 Tbsp. vanilla extract. Vanilla bean paste is a convenient, versatile alternative to vanilla beans. This rich concentrated paste can be used in place of an extract. 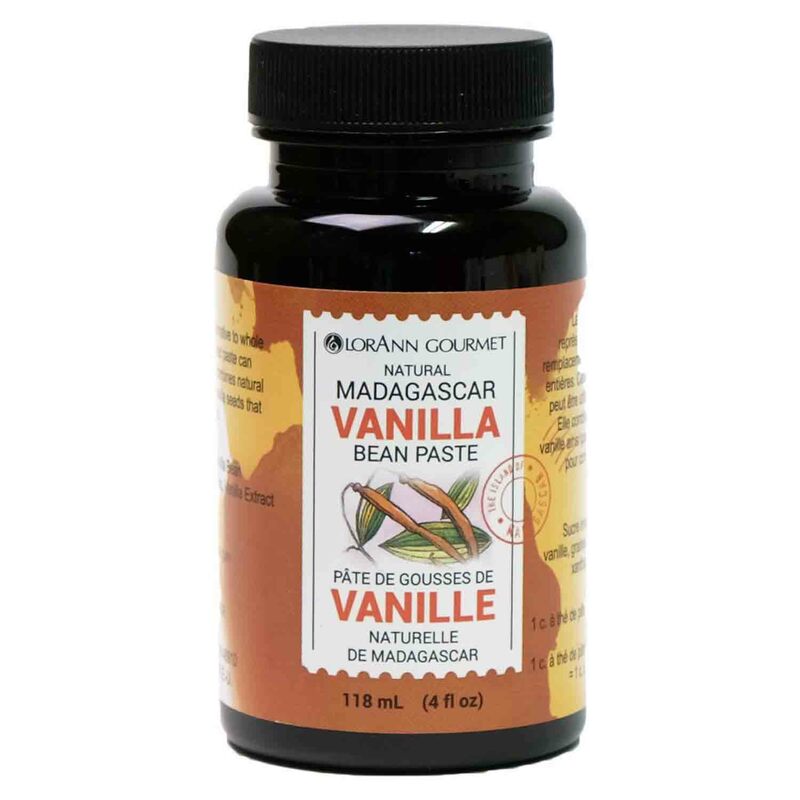 It combines natural vanilla flavor and the distinctive vanilla seeds that will give your food gourmet appeal. Use it to flavor cakes, puddings, sweet breads, cookies, custards, whipped cream and ice cream or anywhere the flavor and appearance of a vanilla bean is desired. 1 Tbsp. vanilla bean paste = 1 vanilla bean. 1 Tbsp. vanilla bean paste = 1 Tbsp. vanilla extract. Ingredients: Invert Sugar Syrup, Vanilla Extract, Vanilla Seeds, Xanthan Gum, Acacia Gum.